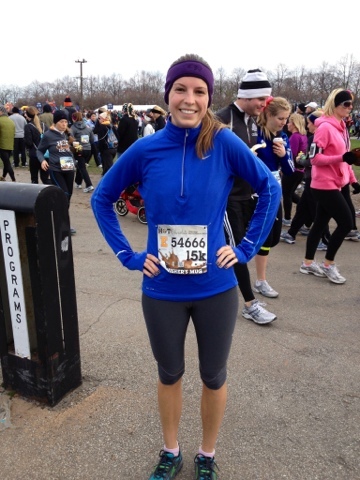 Healthy Fit Goddess: Chicago Hot Chocolate 15K! The Chicago Hot Chocolate 5K/15K was yesterday and it was so much fun and I did great! I beat my goal of 1:20 by finishing in 1:18:52, that's 8:28/mile pace! I was 215 out of 2862 in my age group and 890 out of 11,258 for females, not bad! The weather was pretty good for November, it was a chilly 40 degrees but thankfully not windy. The course was along the lake so the wind could have been bad. I felt pretty good during the race and I'm glad that I prepared adequately. I didn't really start getting tired until mile 8-9, but then I saw Ryan at the end and sprinted to the finish! He was a great boyfriend coming early with me and carrying my stuff so I could wear my jacket until the start. Although, even though I warmed up, I was pretty cold by the time we started because my corral had a half hour delay. I was even in one of the beginning corrals so other people had to wait out there even longer! The course was a little bit crowded, especially before the 5k split. There were already people walking in the first mile, they should have done a slower corral! A race I ran in DC a couple years ago was very crowded and I've learned that it's good to try to get in a fast corral. But it was a good race and I'll probably do it next year again!